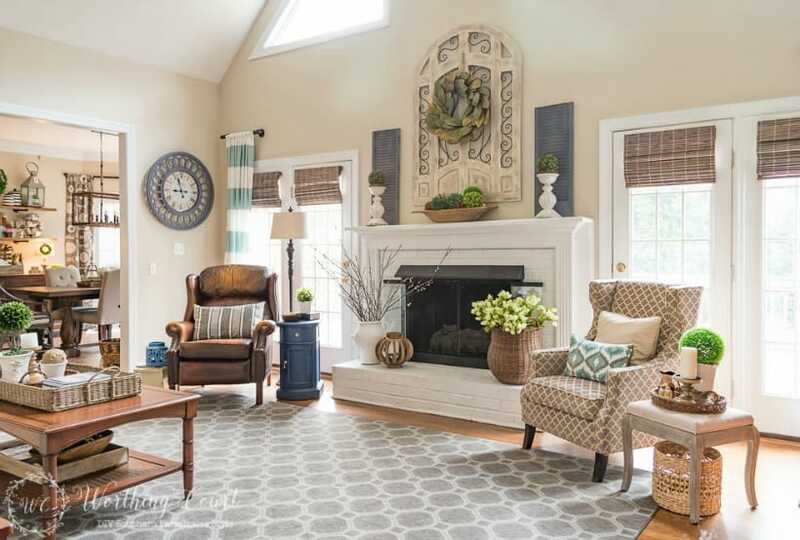 Learn how to decorate above the fireplace in a room with a vaulted ceiling. There’s no denying the instant drama provided by a vaulted ceiling or a two story room, but in can be challenging to figure out what to do with all that wall space. This post contains affiliate links which allows me to make a small commission from your purchase, but at no additional cost to you. See my full disclosure HERE. All that space – it’s amazing – right? And the room seems soooo big. If you have a room with tall ceilings, you might think it would be fun to have all that space to decorate. Well…..yes and no. I’ve lived in three different homes with that situation in the family room and I honestly think that decorating above those fireplaces was more difficult than in other homes with normal height ceilings. But don’t give up! 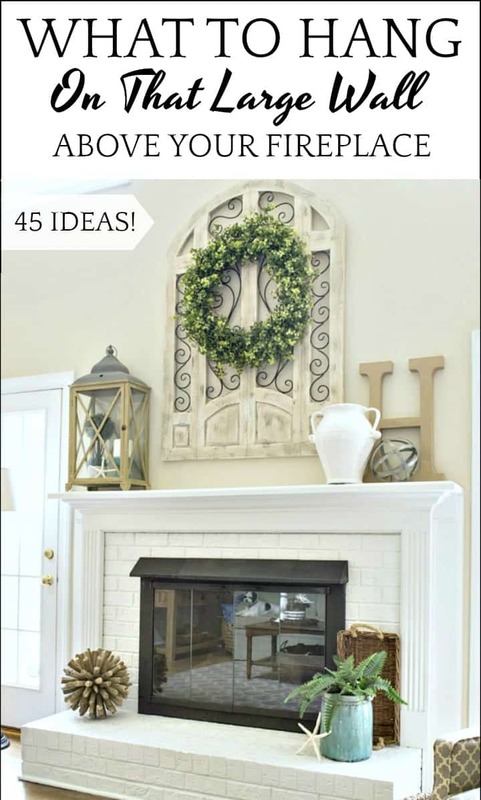 I’ve put together an amazing list of 45 ways to decorate above the fireplace, or any other wall, for that matter, in a two story room. Mirrors are probably the number one most common thing to see above a fireplace. They do a wonderful job of bouncing light around a room and don’t require a color commitment. My tip though, is to be careful what your mirror reflects. It isn’t very appealing to see a reflection of the ceiling or a blank wall across from it. Grouping multiple prints together that coordinate with each other is a great way to use artwork that incorporates the styles and colors of the decor in the rest of the room. Don’t be intimidated by hanging several pieces of art in a group. The easiest way to get it right the first time is to trace around each piece using old wrapping paper or a roll of brown paper, then cut them out and tape them to the wall with painter’s tape. Be sure to accurately mark where the hanger is on the back of the picture so that you can nail right through the paper once you get everything arranged to your liking. Then just rip the paper away and hang your pictures. A large wall clock makes quite a statement no matter where it hangs. They’ve been a hot trend over the last few years and go with almost anything else in the room. Plus – they’re relatively inexpensive so you can usually get a lot of bang for your buck! Art made with wood can add a homey element that you just can’t get from other materials. If you think of wood as being rustic, you can erase that notion from your mind! The popularity of wood art is at an all time high, so you’ll be pleasantly surprised at all of the different style options available. Great ideas to hang over your fireplace – or any wall! Thanks for sharing the ideas and the links. I LOVE the wood/metal arch in your first and last photo. Where is that from? Is there a link? Thank you so much!! Hi Laura. The piece that you’re asking about is from Kirkland’s, but sadly, it’s no longer available. If you happen to be located near Greensboro, NC though, I’m selling mine.